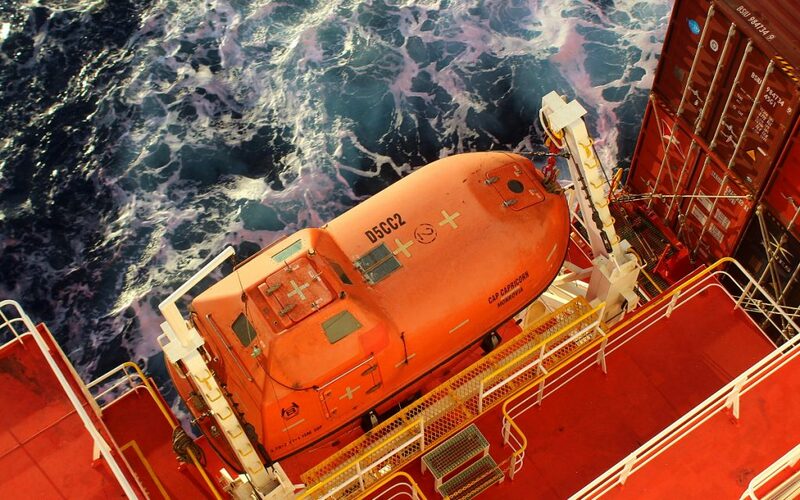 What is it like to be a passenger on a cargo vessel? Here’s all you need to know about cargo ship travel across the Pacific Ocean. Flying is not the only way to travel long distances. For example, the Trans-Siberian railway can take you from Europe to the Eastern parts of Asia within a week. And not even water will force you to board a plane: if you want, you can catch a ride on a ship across any of the world’s oceans. I recently traveled from New Zealand to United States as a passenger on a cargo ship. 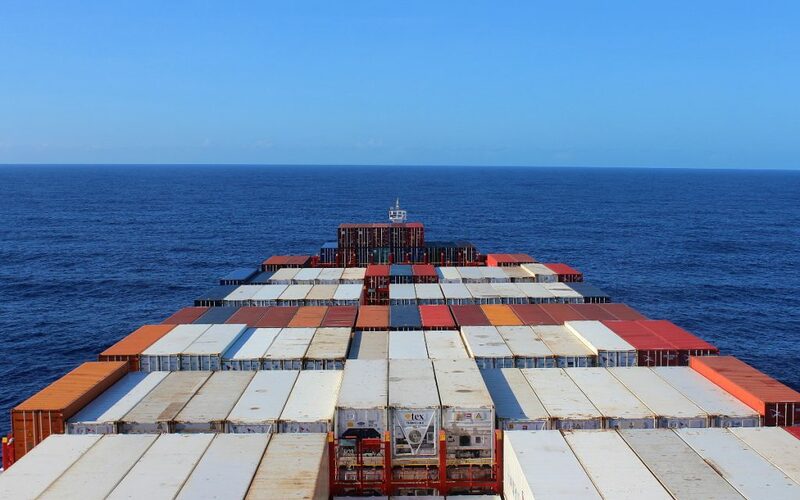 Whether you’re taking a cargo vessel from United States to New Zealand / Australia or the other way around, cargo ship travel can be a great way to cross the Pacific Ocean. Further reading: How Long Does It Take a Cargo Ship to Cross the Pacific? The view out from my cabin window. A room with an ocean view, imagine that! 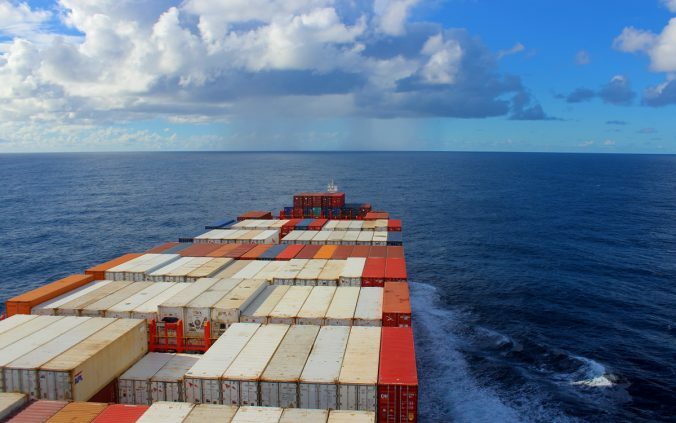 Why Should You Cross the Pacific on a Cargo Ship? 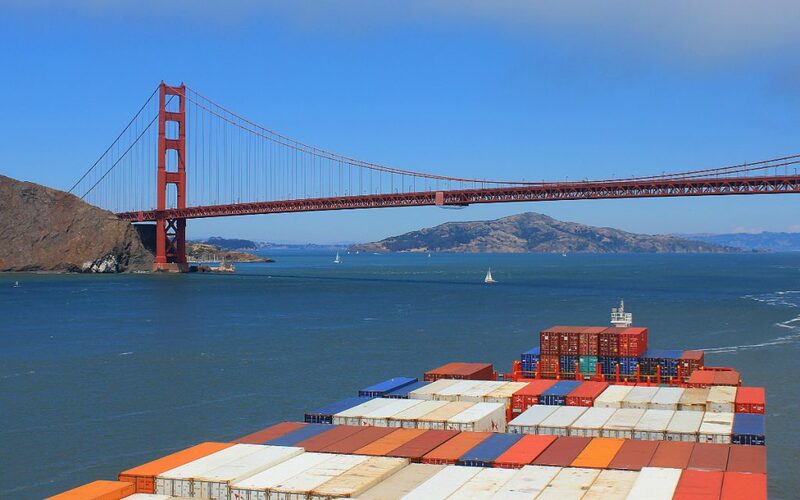 Crossing the Pacific Ocean on a freighter ship is completely possible. But why should you do it? For some people, the reason is flightless travel. Some of these travelers want to avoid the excessive CO2 emissions of flying. Unlike cruising, traveling as a passenger on a cargo ship is considered mostly CO2 neutral. When a freighter ship carries thousands of tons of cargo, having a few extra cargo ship passengers doesn’t affect the total emissions that much. Other people might just enjoy new experiences and the slow way of travel. For me, my reason for cargo ship travel across the Pacific Ocean was a mix of both. I don’t strictly avoid flying, but I try to keep my carbon footprint small. I also like the sense of distance that flightless travel gives me. And after all my rushing around the globe, the idea of staying still for 16 days on a cargo ship across the Pacific sounded absolutely wonderful. 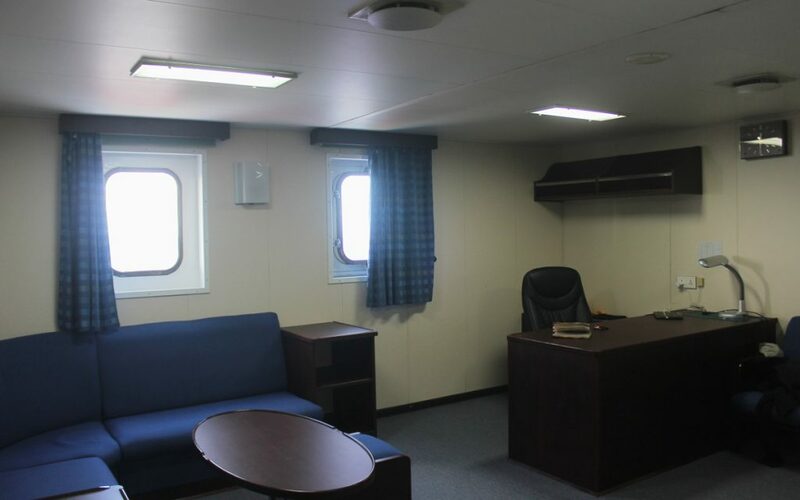 Traveling on a container ship is much more luxurious than many imagine. My fancy cabin had two rooms and a private bathroom. There are many good reasons for cargo ship travel, but the price of cargo ship travel isn’t one. Although many people believe otherwise – hopeful phrases like “travel by cargo ship for free” are quite popular on Google – cargo ship travel is not cheap. Traveling on a cargo ship for 16 days cost me about 2500 euros (meals included), making the journey the most expensive thing I’ve paid on this trip – or ever before it. The same trip in a smaller cabin would have cost 2200 euros, but only a two-room Owner’s Cabin was available when I booked my cargo ship travel experience. You can explore the the ship quite freely during daylight. However, you need to tell the officers every time you leave (and return to) the “accommodation tower”. See Also: How to Prepare for Traveling on a Cargo Ship? How can you arrange cargo ship travel? Unfortunately the days of working on a ship for passage are practically over. You need to be a passenger – and you need to book your freighter trip well in advance. I used a travel agency from New Zealand called Freighter Travel. Hamish from Freighter Travel was extremely helpful and even saved me when I wasn’t allowed to board my plane to New Zealand, so I can give him my highest recommendations. For other booking options, the website FlightlessTravel.com has a great guide on how to arrange cargo ship travel. If you want to cross the Pacific as a passenger on a cargo ship, your options for ships and routes are somewhat limited. Only some companies and container ships take passengers. The starting points and destinations for container ship travel across the Pacific Ocean are also scarce. Ships only travel between popular ports, so getting to less wealthy countries like Mexico or Vietnam is much harder than, say, the United States or Australia. 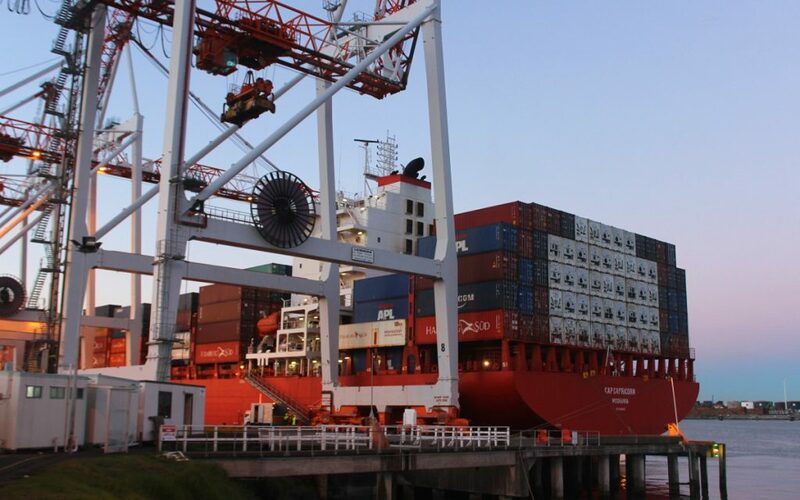 Our cargo vessel spent a night at the Port of Tauranga, New Zealand. If your cargo ship makes stops during your trip, you can often leave for the shore for a while. On the East shore of the Pacific Ocean, popular departure and arrival points include Oakland and Los Angeles in California as well as Panama in Central America. Many ships even pass through the Panama Canal to the East Coast of the United States! In the West of Pacific, Singapore, Sydney and Tauranga (New Zealand) are some of the most popular starting points, although there are other options, too. South Korea, Japan and many other countries on the coast have cargo ships coming and going. Most cargo ships that travel from Australia to United States make a stop in Tauranga. 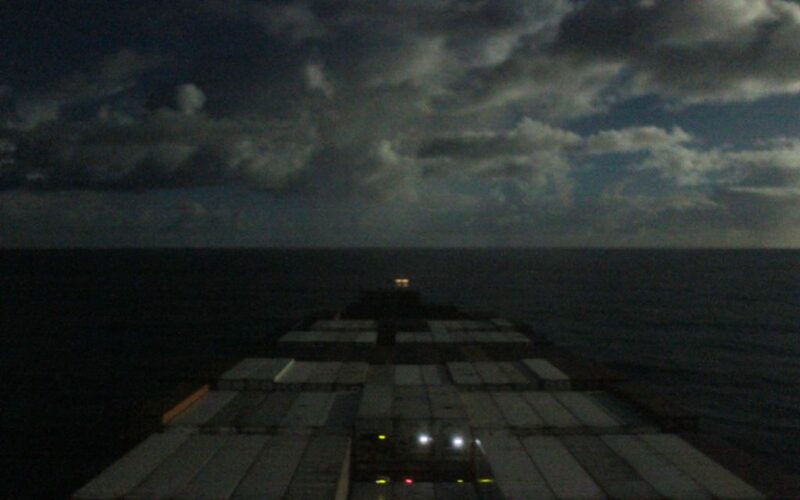 Cargo ship travel from Australia to New Zealand takes about a week, and the Tasmanian Sea often has a stormy weather. 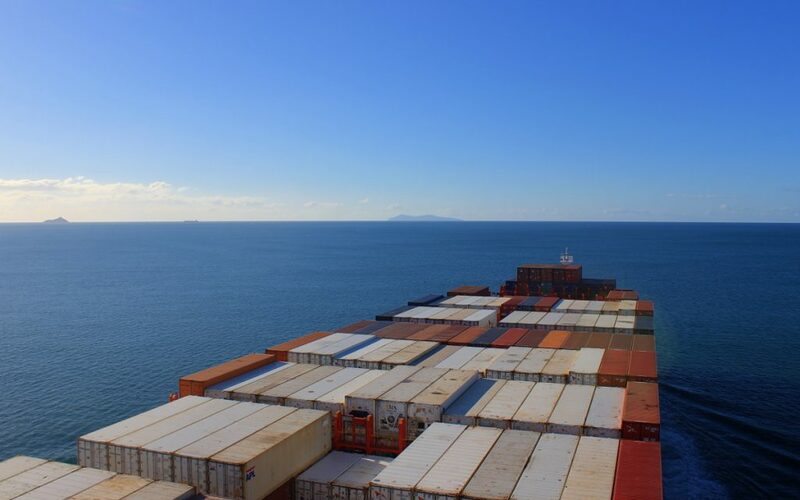 If you want a shorter experience with less risk of bad weather, you might just want to begin your cargo ship voyage to America from New Zealand. “Take good look Tauranga, Mr. Arimo. Next 15 days not see much land”, our captain said to me. July 11th, 2017. I stood on the deck of cargo vessel MV Cap Capricorn and watched as the coastline of New Zealand got smaller and smaller. Our captain, friendly Romanian called Mihail told me to take a good look, reminding me that I wouldn’t see much (read: any) land in a long while. It would take us 10,000 kilometers and 16 days to travel from New Zealand to California on a cargo ship. So, what is it like to be a cargo ship passenger? 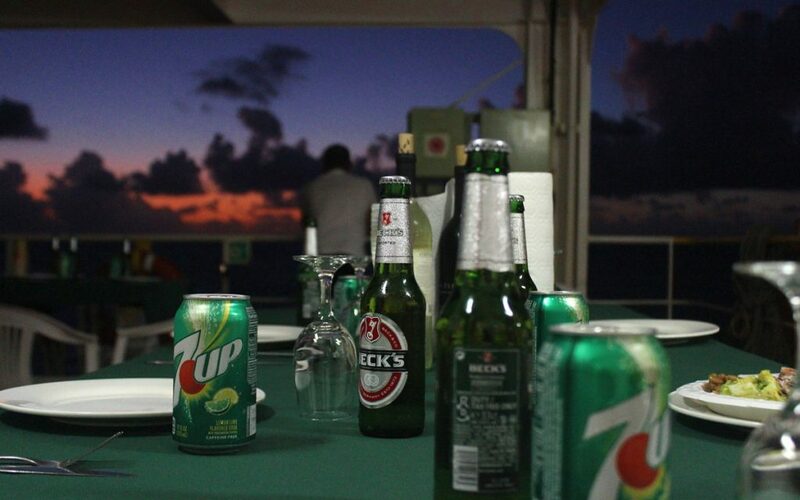 If I had to describe my cargo ship travel experience with one word, it would be stress-free. The lack of proper Wi-Fi (satellite internet doesn’t work very well and it costs fortunes) meant that I could leave all my real life worries and responsibilities on the shore. I ate the meals with the captain and the other officers, but otherwise I had no schedule to follow. I mostly spent my days reading, writing and playing old video games. One evening our captain held a BBQ dinner at the deck. Sunset, great food and good company – I’m not complaining! The lifeboat of our cargo vessel. The emergency procedures were practiced regularly. My biggest challenge was waking up for the breakfast. This proved to be surprisingly difficult as we crossed to a new time zone every few days. Heading east, I had to wake up an hour earlier every time we moved the clock. As I didn’t do any sort of exercise, I didn’t get very tired. After the first week, I would often wake up for breakfast but go back to sleep afterwards. In a way, cargo ship travel feels like a childhood holiday. You know, the kind of lazy vacation where your only responsibility is joining your family for dinner – except your family is replaced by the officers and possible other passengers (our ship had two of us). And it’s not your family home, but a huge ship that slowly makes its way across the ocean. It’s very unlikely that you see any whales or other strange creatures out on the open water. Even spotting a few birds in the middle of nowhere was a rare and special event. Being a passenger on a freighter vessel is much more comfortable than many people think. I had my own, cosy cabin. The food was always delicious, and our captain really made sure I enjoyed my stay. I didn’t even need to worry about getting seasick – we had such a great weather that if I didn’t pay any attention to the vibration of the engine, I could almost forget that I was on a ship. All movies about sea travel show perfectly clear night skies. After witnessing sixteen somewhat cloudy nights in a row, I’m starting to believe we’ve been fooled. In fact, my biggest worry was that my cargo ship travel experience would eventually end. Without an internet connection, I got very productive. I finished a new draft of a novel manuscript I had not touched in six months. I read tons of great books. I played a couple old Super Nintendo video games I had wanted to try for a long time. I even watched Titanic for the first time in my life! Although you mainly create your own entertainment, there are a few services available on board. Our ship had a tiny gym, although I never used it. I got my only exercise when I used the stairs or went for walks on the lower deck of the ship a few times. The ship also had a video game console as well as movies and books on the free time lounges of the officers and the crew, but I never used them, either. I had enough means to keep myself busy during my cargo ship experience without them. Land ahoy! We sailed under the Golden Gate Bridge to get to the Port of Ouakland, California. After sixteen days of cargo ship travel from New Zealand to USA, the coast of California finally appeared on the horizon on July 26th. 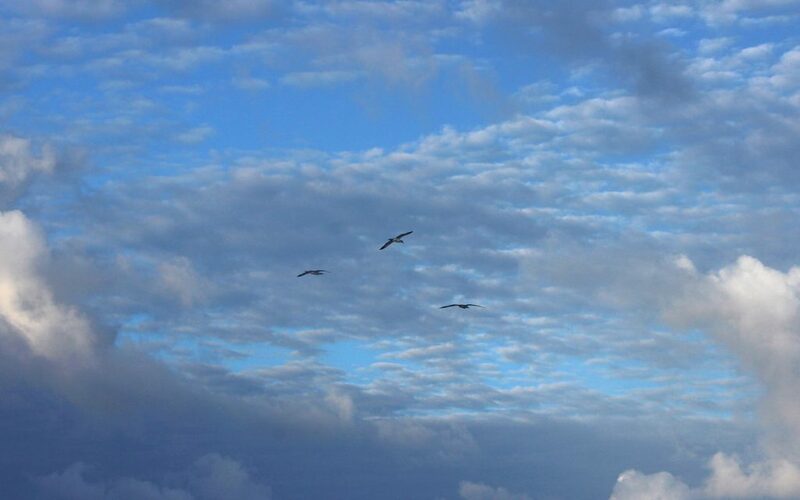 I had seen just a few birds during the last two weeks, but now several seagulls joined us. Even a couple whales came to play on the surface near our ship! As we approached California, the ocean and the sky started to look different. When we got closer to the shore and entered more shallow water, the sea lost its hue of deep blue. The clouds in the sky also looked different because the air behaved differently above the land. 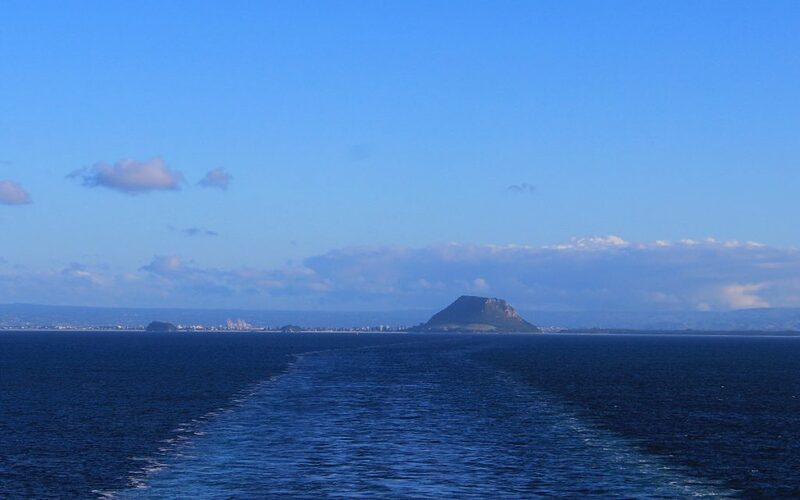 When we left the Port of Tauranga in New Zealand, one of the last things I could see was Mount Maunganui, one of the most popular sights of Tauranga. At the end of my cargo ship travel experience, I was greeted by an even more famous landmark: the Golden Gate Bridge. As we passed under the bridge, the clouds rolled away from above us and we got to see San Francisco at its most beautiful. Welcome to the USA! Blue da ba dee da ba daa! Is Cargo Ship Travel Worth It? Would I recommend traveling as a passenger on a cargo vessel for others? Sure – if the price is not a problem. Flying is cheaper and faster than sea travel, but the cargo ship experience can be very unique. I truly enjoyed my cargo ship travel experience and if money’s not an issue, I’d like to experience cargo ship travel again in the future. Or who knows, maybe the best part was being offline and not following the world news for over two weeks? Hello world, it's been a while! 😊 After 16 days as a passenger on a cargo ship, I finally finished crossing the Pacific Ocean and arrived in California today. It was a very enjoyable and stress-free experience – I'll tell you more about it in my blog within a few weeks! Ps. You may recognize the bridge in the background. I heard it's pretty famous. Interesting post. I am curious if all your meals are included in the 2500 euros? Yes, all the meals are included! 🙂 Glad you asked, I added that information to the post so no-one else needs to wonder. Thanks for sharing your adventure Arimo! It’s an experience a lot of “merchandise” has, but not one very many “people” have. Interesting that it was MORE expensive than air travel! From the Rob Long cargo ship story I think I told you about, he made it seem that the cargo ship pricing was quite modest and much less than air travel!? You’re welcome Glenn! 🙂 I’m surprised that Long’s trip was so cheap. Of course, the price seems a less high if you compare it to flying + 16 nights in a hotel + eating in a restaurant three times a day. I know Hamish here in Napier. I was lucky to cross the pacific by helping on a ship from Los Angeles to Sydney to Bridbane to Fiji. After having wondered this little world for the last four and half years. It was called “work your passage” but these words today have a different meaning to 1982. A group of 4 (all not know each other) ended up on the NAD Lyllitop (?spelling) the third biggest rollonoff-rollon ship in the world then. i’m also very happy to hear that you know Hamish. Although I haven’t met him personally, he came across as a very kind and understanding gentleman during our email correspondence. If you have a chance, you can say my thanks for him! Hi, i am considering traveling to S America via freight travel. It will be one way because i plan to move there, so that permitted? Also i will be brining a lot of stuff. What is the processes of bag check? And when i arrive at the port im exiting, whats the luggage process there? I look forward to giving it a try because i love sea living! Hope to hear back! On my trip, there was actually no bag check at all on either end 😀 But don’t trust that to be the norm. I don’t know how much is the maximum, but having a few bags shouldn’t be a problem. As long as your visa is in condition and you meet other requirements for entry, one-way trip should be fine! Nice. 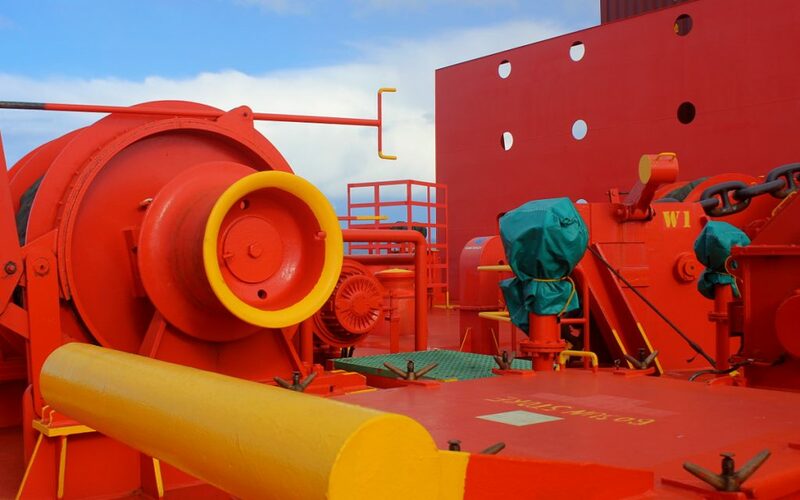 Travelling in cargo ships provides you an amazing experience. There are generally no peak or off peak prices as there are not a lot of cabins to fill. Thanks for sharing your experience. How do you book this? It sounds terribly boring, yet completely fascinating at the same time. I don’t know if I would be able to handle this. Haha, “terribly boring yet completely fascinating” sound like a good summary! 😀 There are some travel agents that specialize in cargo ship travel. I used one called Freighter Travel (https://www.freightertravel.co.nz). desperate me – Barbara J. O’Brien need to travel with furniture, bedding etc personal living items, to USA, for “sole de patie” a way of entering the US inorder to live there lawfully….need a shippinbg line to take me, as above…please phone me – urgent need to arrive before 15 August 2018, from Auckland NZ. Please can you help me to above??? Unfortunately I cannot help you, but I recommend that you contact a freighter company or a cargo ship travel agent. They might be able to give you more information. Hi, just did this very journey from tauranga (where i live) to Oakland in May. i read your blog before booked it. and you did a very good summary of the experience. I would do it again too, but in retrospect i would have done it the other way around so i could have some time looking at the other ports. Yes, captain was very friendly, could not have asked for a better crew really. The Chief Engineer also took me for a tour in the engine room one day. It is a unique experience to travel on a freighter. Have you ever been on a King Ocean ship (www.kingocean.com)? They are huge boats!